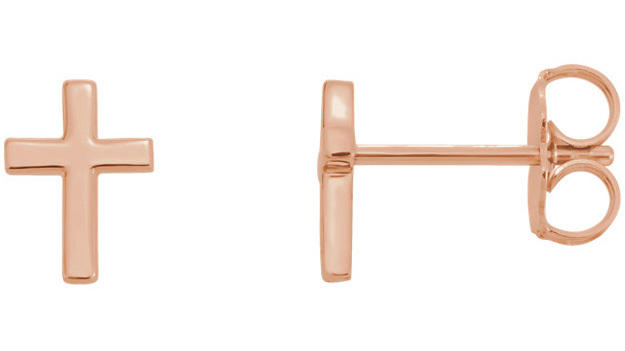 Rose gold combines with a simple, yet delicate cross in these 14K rose gold cross stud earrings from Apples of Gold Jewelry. 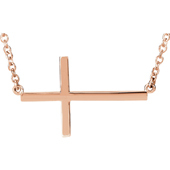 The soft, pink gold hue of the rose gold makes the crosses on these earrings stand out, and they are perfect for wearing any time of day, whether for an important occasion or just around the home to carry a symbol of your Christian faith with you. The earrings measure 7.5mm x 5.5mm and feature a friction push back closure on each. We guarantee our 14K Rose Gold Cross Stud Earrings to be high quality, authentic jewelry, as described above.